To Quiz Your Doctor is to get as much information as you possibly can, and to insure you get the most accurate diagnosis, the best Tendonitis treatment options, and a complete recovery. To Quiz Your Doc, you need to know the right questions to ask. Most people don't take the opportunity to thoroughly question their doctors. We take for granted that our doctors have all the right answers, and that they know what's best for us. You certainly don't need to stay silent if you have questions. If you want your pain to go away, you want the doctor that is best prepared to help that happen, you want the doctor with the -RIGHT- education. Depending on who you see, a general practitioner, a specialist, or a surgeon, each doc has his own set of knowledge and education. As is the case in any profession, not all practitioners are created equal. will determine whether you get surgery or not. Keep in mind, some things you just have to get surgery for. In the case of Rotator Cuff Injury, it depends. If the tendon is mostly or completely separated, then yes surgery. If your shoulder just hurts badly because of Rotator Cuff Tendonitis, then no surgery. 1. What else -could- it be? Symptoms are funny things. Pain in one spot can be caused by a variety of causes in a variety of spots. This can make getting a correct diagnosis tricky. And wouldn't you feel silly getting treatment or surgery for the wrong issue? You would certainly still feel the pain as that treatment and surgery would be ineffective. 2. Are you sure? What did you see that makes you confident that that is my problem? Ironically enough, you might want to shy away from a doctor that is 100% sure of her diagnosis. That often means that there's no room to discover more, or make a change for the better. 3. What are the best methods of self care to make this go away? inflammatories, and ergonomics. You want to deal with the SOURCE of the problem. How did this problem come about? How do you reverse the tendonitis process that got you where you are at now, and heal completely? 4. Can I completely reverse Tendonitis without surgery? Overall, I suggest you go with a mindset that says "YES. I Can Reverse This." Because you can. Tendonitis is not a one way street if you know how to deal with it. It will be interesting to hear what your doctor has to say. It's likely that it will be on the 'No you can't' side of the equation. You'll be given prescriptions for rest, and anti-inflammatory drugs, and splints/braces, possibly physical therapy. When those don't work, surgery is next on the list. 5. Why -exactly- do I have this pain? The answer should be something along the lines of: muscles are too tight, connective tissue is too tight, there is a chronic inflammation process, and you're lacking various nutrition. Why shouldn't those be the answers? For those same reasons, carpal tunnels don't get constricted all by them selves. Something makes that constriction happen. Will surgery fix that? For those same reasons, nerves get compressed for a reason. Cutting away the too tight tissue that is doign the compression DOES NOT get rid of the forces that made that tissue too tight in the first place. Doctors and surgeons are great for many many issues. But can they REVERSE Carpal Tunnel Syndrome or any other Tendonitis? Quiz your doctor, see what they say. When your doctor recommends surgery, there are some tidbits of information you absolutely want to be informed of. 1. What is your rate of success with this surgery? And by 'success' I mean 100% recovery. I don't mean 80% better in 6-12 months. 2. What do you expect my chances of a full recovery to be? You doctor is unlikely to make a strong prediction here. Don't hold that against her. She is afraid of getting sued, and rightfully so. Ask the question anyway, just to see what they say. You will get some sort of valuable information. Just for fun, ask them if they will guarantee a full recovery. 3. Will the surgery deal with the root cause of my problem? It is vital to understand that the root cause of Carpal Tunnel Syndrome is -NOT- a narrowing of the Carpal Tunnel (for instance). The root cause of Achilles Tendonitis (for instance) is -not- the tendon itself. So this question absolutely does deserve a specific answer. Quiz your doctor. If the answer is not specific, this points to the doctor either not being sure of the -cause- of your problem, or being unwilling to commit to a diagnosis and a promise to 'fix' you. "Let's do surgery and see what happens," is a poor mindset to operate from. 4. What is your infection rate for this surgery? This can get a bit tricky. Every office and hospital keeps track of these statistics differently. If it's an infection that goes away quickly, it may not be counted. If it's an infection that kills a person, it might be counted as something else and not go into infection statistics. You want to know if your surgeon can keep you infection free. Sure, there's -always- a chance of infection, but still. 5. Are there any important arteries or nerves that are in danger of being injured by the surgery? Carpal Tunnel Release Surgery attempts to cut the connective tissue that surrounds the median nerve. Major blood vessels are right there too. During a Carpal Tunnel Release Surgery, doctors try to avoid damaging the nerve and blood vessels while they attempt to severe the ligament (flexor retinaculum, also called the transverse carpal ligament) that is 'constricting' the median nerve. This often keeps them from severing the ligament completely, thus not achieving a complete 'release'. Which, of course, leaves you with pain and numbness and sets you up for 'needing' another surgery. In contrast, Rotator Cuff Surgery and surgery for Achilles Tendonitis, depending on the specific site of the surgery, are much less at risk for nerve damage. Quiz your doctor, ask some questions, and take a look at an anatomy book before you do. 6. Will you promise not to cut my nerve? I promise you won't find a doctor that will make that promise. Look at the Carpal Tunnel Surgery Statistics page for more information on severed nerves in Carpal Tunnel Surgery cases. Ouch. 7. The rest, anti-inflammatories, splints and braces, physical therapy, etc that you prescribed didn't help. So why do you think surgery will help, since the other things you prescribed didn't? If the doctor has been 100% wrong so far, why would s/he be 100% correct about recommending surgery? None of the other stuff they recommened worked, why exactly do they thing surgery will do the trick? Quiz your doctor, and see what they have to say in response to that question. Be nice about it, of course. If you're going to go under the knife, it's a valid question to ask. 8. Have you ever had a malpractice suit filed against you? And if'yes, how many? That's a good thing to know, right? 9. How long will it take me to make a complete recovery? Again, I'm talking about 100% recovery. 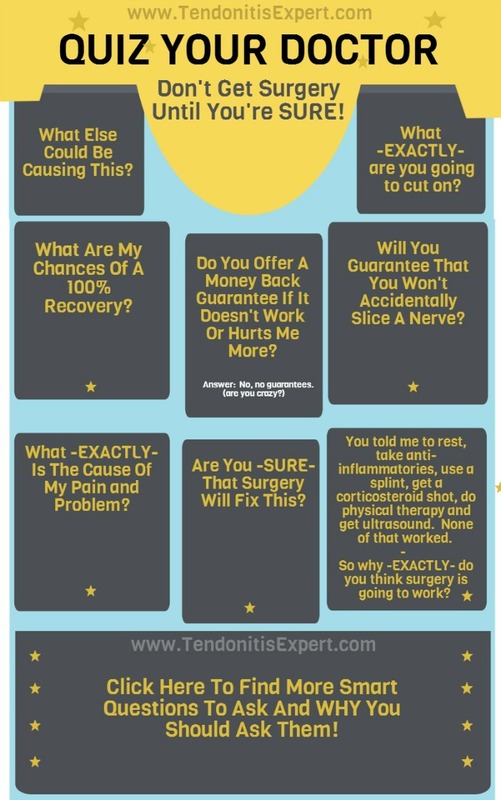 If it is going to take 2-6 months or more to recover, keep in mind that much of that recovery is recovering from the injury that surgery causes. And what if you could fully recover using other methods? If you Quiz Your Doctor and your doctor can't guarantee you a 100% recovery, surely there must be an alternative treatment to surgery that will give you just as much benefit, or more, without all the slicing and recovery. See the list of my self-care guides over on the right hand side of the page. You can start getting out of pain right now when you learn How To Reduce Tendonitis Inflammation. It's not a fix per se, but it will lower pain levels.